Billionaire-Liberal and Political-Kingmaker George Soros wasted his money on John Kerry’s 2004 Presidential bid. However, he was not discouraged by this failed effort, as he had alternative plans to influence the direction of U.S. foreign policy. In 2004, Soros hosted a meeting with the then Ambassador to the United Nations from the Islamic Republic of Iran, Mohammad Javad Zarif. Soros and Zarif talked about the possibility of a future “grand bargain” between Washington and Iran. In 2005, he arranged a meeting between Zarif and Senate Foreign Relations Committee member Senator John Kerry. So when Iranian Foreign Minister Zarif met Secretary of State Kerry in Geneva last September to discuss Iran’s nuclear programs, it was a meeting between well-acquainted friends. Zarif has lived many years in the United States. In fact, he earned his undergraduate and graduate degrees at American colleges. He also has spent a good deal of time and energy recruiting admirers among America’s intelligentsia. He even approached me while I was the Senior Iran Political-Military analyst for the Defense Intelligence Agency. Kerry, a Boston Mandarin, apparently has the ability to rise above the pedestrian politics of bilateral relations. His ego is not beyond imagining that he will arrange, with the help of his friend, Zarif, a “grand bargain” between the United States and Iran. But first, Kerry must find a way to finesse the issue of Iran’s drive for a nuclear weapon with its attendant ballistic military delivery system. This is a substantive obstacle, since Iran probably already has the capability to fashion a nuclear weapon. However, it may not yet be able to shape a warhead to “fit properly” on its missile nose-cone’s re-entry vehicle. But it just needs a bit more time for that. Then there is the issue of Israel, the most likely recipient of the warhead should it come to that. Tel Aviv does not trust the Islamic Republic to abide by any agreement unless it dismantles its existing nuclear architecture. This includes its supply of enriched uranium, thousands of centrifuges which can produce even more, and various facilities critical to the development of its nuclear weaponry. One might ask then, why should the U.S. Secretary of Defense trust Iran to abide by any agreement? Even if existing sanctions against Iran helped bring Tehran to the bargaining table, the Islamic Republic will remain at war against the United States. After all, the Islamic Republic was responsible directly or indirectly for a third of American military casualties in Iraq. There is still the issue of Iran’s support for terrorists and destabilizing insurgencies around the world. 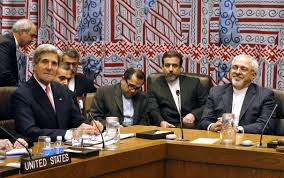 Moreover, Tehran has sought to derail several attempts to negotiate a settlement of the Palestinian/Israeli enmity. Recently, this effort was highlighted by the Israeli interception of a shipload of weapons earmarked for radicals in the Gaza. Most telling of all, how can any nation-state trust a regime that murders its own citizens at the most prolific rate of any society on earth. Since the “Smiling Mullah” Rouhani became President, over 400 Iranians, mostly young people have been executed. That is just the ones we know about. One should just Google the photos of bodies hanging from construction cranes in Tehran. Nevertheless, Zarif like his President Rouhani, smiles a lot. Americans like that. He even somewhat obliquely has acknowledged the Holocaust and sent a Jewish New Year’s greeting to Israelis. Moreover, he speaks perfect English and his son and daughter were both born in the United States. Zarif is urbane, witty, and charming. And he is hip even using twitter. Too bad the rest of the Iranian people who use twitter have it filtered by Iran’s fundamentalist regime. What more can we ask for? It is certainly enough for Senator Kerry. (1) Can you describe the relationship you have had with Zarif prior to your having been named Secretary of State? (2) Why did you assiduously feel a need to keep secret your daughter Vanessa’s marriage to an Iranian-American until after you had been approved by the Senate as Secretary of State? (3) Why did your daughter and Behrooz Vala Nahed keep secret the guest list at the wedding? (4) Do you think your new son-in-law Vala Nahed was being disingenuous when he said that he did not know your daughter was Senator Kerry’s daughter? (5) Have you heard about the rumor among Iranian-Americans in Los Angeles that Zarif’s son was your son-in-law’s best man. Is this true? (6) Is it also true that Vanessa and Behrooz have traveled to Iran? (7) Do you see any grounds for a conflict of interest here, given your responsibilities and security clearances? Of course, you must know that many loyal Iranian and Arab-Americans have been denied clearances for less. (8) Has your son-in-law’s parents given up their Iranian passports? (9) What is your son-in-law’s passport and citizenship status vis-à-vis Iran’s terrorist regime? (10) Are you certain that none of your son-in-law’s extended family have no contacts with the Islam Revolution Guard Corps or Iranian intelligences services? (11) What about Behrooz’s file at the Islamic Republic’s interest section in Washington D.C.? (11) Oh Senator Kerry, one last question. Have any of your “inside-the-beltway” senatorial colleagues asked you any of the above questions? (12) And by-the-way, John, given the pro-Palestinian views of Episcopalian Bishop Shaw who officiated at your daughter’s wedding, don’t you agree that Israelis might have reason to be worried about the U.S. Secretary of State’s pledge to have Israel’s back. One of my biggest concerns is the threat of the Islamists Government in Turkey turning Turkey into another Islamic Republic, and destroying the secularism that Ataturk fought for. What encourages me is seeing the Turkish people fight for their freedom every step of the way. My condolence goes out to the Berkin Elvan's family. 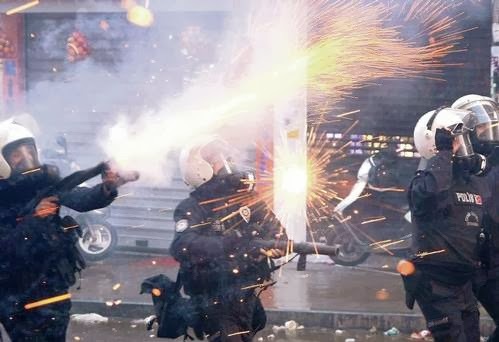 I hope we will start to see the police in Turkey stand with the PEOPLE rather than with the Islamist Government.